If you are like me, you have a ton of recipes pinned on various Pinterest boards that you have never tried. But the intention is there because they were pinned after all. I am working on trying to change that. 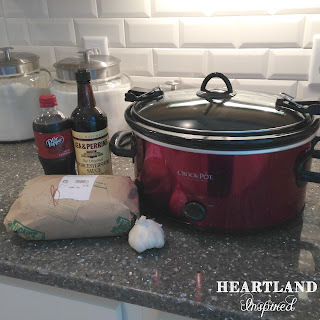 There are some amazing recipes out there and this one that I tried is a keeper - Dr. Pepper Slow Cooker Roast Beef from Add a Pinch. I really had a craving for a roast of some kind. It had to be super easy and not require a million ingredients that I would have to go out and purchase. And this roast fit that bill. It took all of 30 seconds put together and it made a ton. I even froze some of the leftover meat for later use! I served the roast some mashed potatoes and roasted Brussel sprouts and had a super delicious meal! Definitely give this roast a try!